In order to make things happen, organizations need alignment, common goal and commonly agreed ways of working. This is easy to remember sitting at my desk but difficult to keep this in mind in real-life coaching situations. There is trap and I developed a simple illustration to remind myself about it. The height illustrates how easy/difficult it is to reach agreement for a question. Throw a ball in such shape and it tends to fall to gravitational minimum, lowest point. In decision making, such minimum is agreeing on “What”. It is quite easy to reach common agreement on “What”, but this leads to obvious problems. If “Why” and “What does it mean” are left with little attention, decisions become diluted, misunderstood and actions do not lead to the expected outcome. A very important role for a coach is to push the ball uphill, both directions, and keep asking: “Why are we doing this? What does this mean?”. I learned right side of the picture a few years ago, coaching R&D teams in a large corporation. Middle management started to support Agile transformation and decided several actions for coming quarter. Actions were good: they were about using continuous integration, investing in test automation and improving quality of product backlog. However, one flaw in the plan ruined it: huge (hidden) disagreement on “What does this mean”. As a consequence, everyone was taking unaligned or conflicting actions. All was done with the best intention, but lack of commonly agreed working practices turned most of the effort wasted. At that point I made this visible by asking: “What changes in your daily work when you <X>” (X is “do continuous integration” or “improve PBL in frequent grooming sessions”). The consequent discussions were sometimes unpleasant, but necessary to sort out the different understanding. I was aware of the left side (“Why”), but a recent incident made the importance very clear to me. I invited a meeting to discuss and agree working practices for invoice & cost follow-up in a government-funded research project that we were part of. Colleague of mine started meeting by asking: “Why are we part of this project?”. I was stunned! What a waste of time — I knew everything about the project and its importance. Very soon I realized not everyone knew about the project goals or purpose. And I did not know how others saw “the big picture”. Later on, many participants came to thank me how important is was to create common understanding about the task at hand: “I’ve been working 2 years on this and only now I understand why this paperwork is important and how my work relates to project goals!” And when everyone knew why we are in, lot of people started contributing to the project — even outside of their area of responsibility. p.s. Final note to avoid misunderstanding: Asking “Why” in this context is not about Lean philosophy of “Challenge everything”. The point is not to attack initiatives or try to challenge their validity. 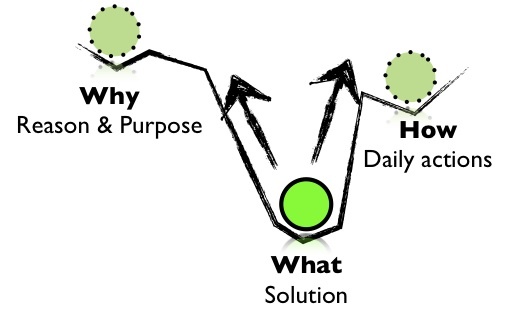 Point is to facilitate common understanding across teams and get a common answer to “Why”. Through this common understanding people may decide to drop something, but more important is to reach alignment among all involved.